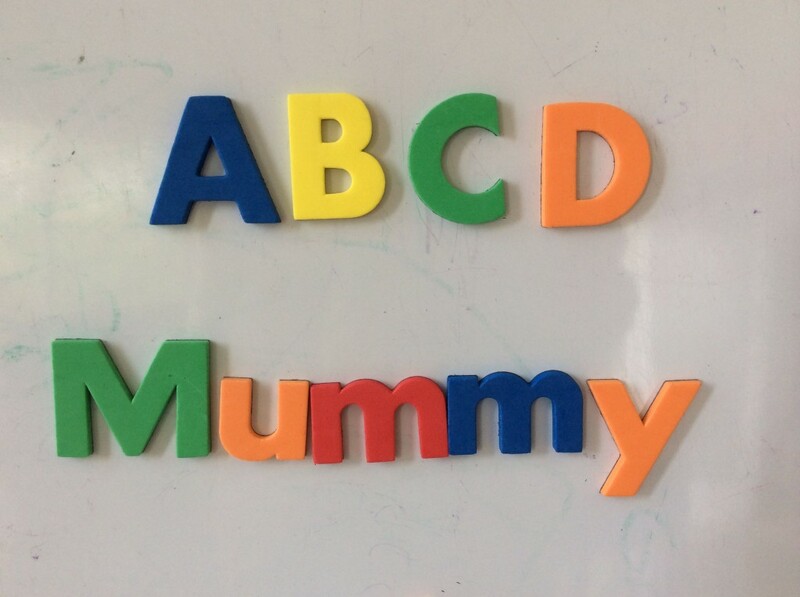 Magnetic letters are one of those things that parents often buy for kids but don’t really know what to do with them. The letters end up sitting on the fridge, collecting dust. What’s so great about magnetic letters is their versatility. They can be used in a variety of ways to promote children’s literacy development, from toddlers to primary school kids. I’m going to share with you some magnetic letter activities that you can do with your pre-school age child. For toddlers, read this post. Mix letters your child knows in with other letters. Make sure you put them all right side up, as you would read them. Have your child find letters and move them to the other side of the fridge/board. 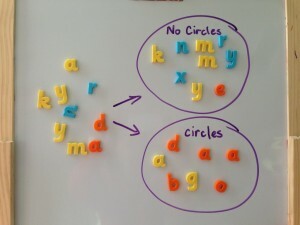 (Your child is learning to visually discriminate letters in this activity.) You should prompt for letter names, letter sounds, and words that start with the letter. Prompts to use: Can you find your letter___ (first letter of child’s name)? Can you find Daddy’s letter? I bet you can’t find the M! Find the letter that starts ‘sun’. Find the letter that sounds like /mmmm/. Variation: Take turns being the “asker”. Have your child ask you to find a particular letters, too! What is the last letter of your name? Then mix the letters up and make the name again. Make it more challenging by setting a time limit. E.g. Can you make your name before I count to 10? Variation: Make the name mummy (or your first name) and other family names. Or make your child’s full name. Start with many letters on the surface—maybe 15 to 20. Ensure there is a balance of the the two types of letters your child is sorting. It’s great if you have extras of the same letters. 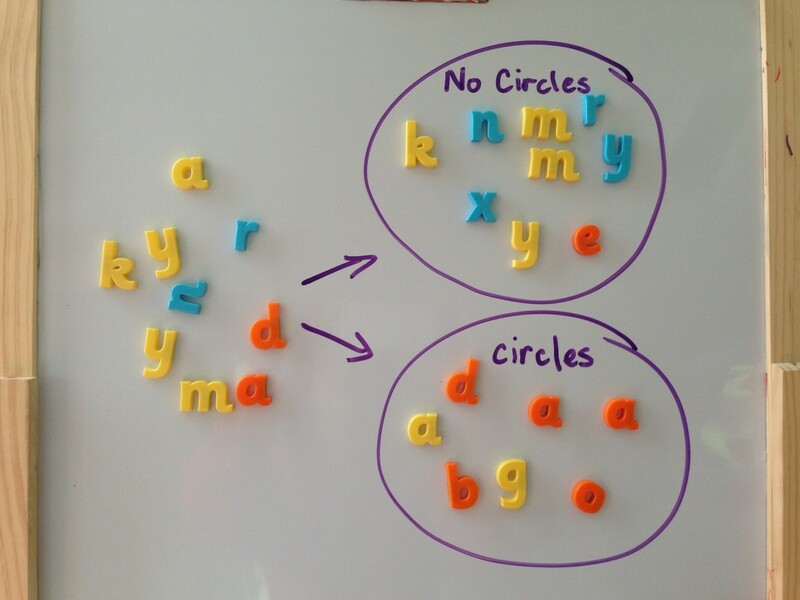 If doing it on a board where you can draw, make two big circles for sorting letters. Aim to get your child to sort faster over time. There are various ways children can sort letters. All of these activities promote visual discrimination. This means kids need to look carefully at the distinctive features of each letter, and compare and contrast them with others. This skill is important when children start to read, as they need to be able to recognise letters very quickly. This is an easy letter sort to begin with. This works especially well when you mix both capital and lower case letters. It draws attention to the fact that capitals are all tall letters. Most letters contain straight lines – A, R, h, k, l, b. But a few do not – S, O, C.
Some letters have ‘tunnel-like’ features – n, h, m. Drawing attention to these type of features should help kids when they start to write letters, as they will notice the similar letter formation. This is a more challenging letter sort, as the child needs to be very familiar with his or her own name. This is by no means an exhaustive list of how you can use magnetic letters with your child, but it is a start. As always, I would love to get feedback from people who try out these activities. Have fun!